A few moons ago, there was this incident. 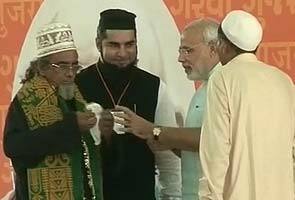 A Muslim cleric decided to ambush Narendra Modi by offering a skullcap at a public political event. [Video] While Modi did not wear the skull-cap, he did wear the green Islamic shawl the cleric offered (this was not reported). This immediately set in motion the gears of nightly-news-outrage and morning-paper-editorializing. To govern a country like India, you have to take everyone along; sometimes you will have to wear topi and sometimes tilak (kabhi topi bhi pehenni padhegi, kabhi tilak bhi lagana padega). No discussion of Modi or of Indian politics can be complete without an ogle at the concept of “secularism”. In India, politicians are expected to be “secular”, at least as far as demonstrations go, in the Nitish Kumar way of things, much more than they are expected to efficient or to be honest. And the thing about Modi, he is not secular. After all, if he was, he would have worn that skullcap. But wait. Let’s go back and look at that skullcap incident once again. If secularism is the equal treatment of all religions, then we should be able search-replace, as we do in MS Word, the individuals concerned and the religions, and the conclusion “Oh My God, that is so communal” should stay the same. So I am going to do it. Let us say that Manmohan Singh was put in the same situation, would he be expected to wear the skull-cap? If Mehbooba Sayed was asked to wear sindoor, would she be expected to honor that request? Let us say Hamid Ansari was asked to wear a tilak, and he refused, would that be held against him? If I was asked to wear a Chennai Super Kings, would I have to, at the cost of being assigned a pejorative label, even though I am as big a cricket enthusiast as…well you know who. Some people would say, and not without reason, that the person foisting off the item of his religion should be seen as the guilty party since he is trying to actively impose his way of life on someone else (in this case, to make a political point). At the very least, we should accept, if we go by the conventional definition of secularism, that Modi has every right to his personal beliefs and the right to set his own personal boundaries, and not be judged for them. Many would say “Oh but the real problem is Gujarat 2002.” Well if it is, one should just keep at it instead of using this incident as proof of Modi’s communal dark heart. The reason this apparent non-issue is important, is because it exposes a somewhat non-obvious assumption. That the Nehruvian legacy, which is still very much alive in our current government and in our mainstream media discourse, does not allow secularism to be defined as the equal treatment of all religions. That dictates, that in the interests of pragmatism and national unity, one has to lean more towards minorities, and that strict equivalence between majority and minority in a complex country like India is not practicable. (The same logic is given for “freedom of speech”, in India, one must be more “sensitive” but that’s a discussion for another day. )This is why Dr. Singh says that Muslims have the first right to national resources. This is what drives, at least on principle (the use of “principle” here is intentional, the “real reason” of course is politics) legislation like the Communal Violence Bill, which defines “minorities” in an absolute way (on the basis of religions) and not on the basis of numerical minority in a particular place (A Hindu in a Muslim-majority area would not be considered a minority). As per this concept of secularism, it stands to logic that anyone who wants to be the leader of the nation and is a Hindu, has to be held to a different standard behavior than someone who is not, so that minorities do not feel embattled or threatened. The supporters of this definition of secularism point to Pakistan as an example where this Nehruvian ideal was not followed, and, well they say, look where it is today. While this notion of secularism definitely has its adherents among urban Indians, those that talk about the “Muslim veto”, there are also many others who want to define secularism in terms of equal obligations. In other words, no slant. No special treatment for minorities. No special treatment for castes. They reject the example of Pakistan as the only possible outcome for an alternate notion of secularism, pointing to a substantial difference between what Modi proposes and “the religious theocracy” which Pakistan is. Instead, they consider another country as an ideal, sometimes without even realizing it. This requires some explaining. And the introduction of another word. In a interview which garnered significant attention (As an aside, everything Modi says gets attention. He has to say “Kumar Gaurav” and people will start watching his movies.) Modi said. I am nationalist. I’m patriotic. Nothing is wrong. I am born Hindu. Nothing is wrong. So I’m a Hindu nationalist. So yes, you can say I’m a Hindu nationalist because I’m a born Hindu. This has of course led to much outrage because of the words “nationalism” and “Hindu”. Before, I delve into the “nationalism” part, allow me to post an extract below of what Maulana Abul Kalam Azad said. I am a Muslim and profoundly conscious of the fact that I have inherited Islam’s glorious tradition of the last fourteen hundred years. I am not prepared to lose even a small part of that legacy. The history and teachings of Islam, its arts and letters, its culture and civilization are part of my wealth and it is my duty to cherish and guard them. But, with all these feelings, I have another equally deep realization, born out of my life’s experience which is strengthened and not hindered by the Islamic spirit. I am equally proud of the fact that I am an Indian, an essential part of the indivisible unity of the Indian nationhood, a vital factor in its total makeup, without which this noble edifice will remain incomplete. I am a Hindu and profoundly conscious of the fact that I have inherited Hinduism’s glorious tradition of thousands of years. I am not prepared to lose even a small part of that legacy. The history and teachings of Hinduism, its arts and letters, its culture and civilization are part of my wealth and it is my duty to cherish and guard them. But, with all these feelings, I have another equally deep realization, born out of my life’s experience which is strengthened and not hindered by the Hindu spirit. I am equally proud of the fact that I am an Indian, an essential part of the indivisible unity of the Indian nationhood, a vital factor in its total makeup, without which this noble edifice will remain incomplete. If Modi had said this above, which is definitely a more clear attempt to separate out the two identities than his more terse statement (which still says more or less the same thing), I am pretty sure there would still have been a national fecalstorm. Much of it is of course because of the person saying it, both his past history and his present significance, but some of it is definitely due to two very loaded words, namely “Hindu” and “nationalism” , present in Modi’s sentences and not in the Maulana’s. First, let us look at nationalism. Though no one says it is wrong to use the word, as a matter of fact they will say “Why didn’t he just say nationalist?”, the problem lies in the word “nationalist” itself. The Leftist perspective of history interprets the march of civilization as a generational conflict between classes, principally, between the working class and the privileged. Religion and its variation, nationalism (where the God is the nation) are considered, by that world view, to be insidious tools used by the privileged to manipulate the working class into working against its own interest, preventing them from coalescing into the brotherhood of the working class, unfettered by national identities. Which was why a section of the Communist movement in India supported China in the war against India, because the nation of China was the brotherhood of the working class, and yes, I don’t even want to dissect the irony of a nation using the concept of the anti-nation for its own strategic national objectives. As if the perfidy associated to it by the Marxists was not bad enough, the aggressive, hyper-nationalism of Germans, held responsible for the World Wars and the Holocaust, led to its permanent semantic hyphenation of nationalism with fascism and tyranny. Because of this, anyone proudly asserting their nationalism even if they mean “fidelity to the nation” is either a suspect fascist or overtly dramatic in a very Sunny Deol or Manoj Kumar way. Given the origins of the RSS in the teachings of Golwalkar, and given the way Modi has been depicted in the media, the outrage in media was natural. However it is precisely this nationalistic rhetoric appeals to a large section of that demographic, which, explicitly or subconsciously, holds the US as a model of what India should be. Americans have no qualms in hammering the concept of “American exceptionalism” (which put simply means the rules that apply to the world do not apply to them) and even the most liberal of Democrats openly say ” America is the greatest nation in the world”, without drawing snarks from the New York Times. And, contrary to what is often said nationalism being hand-in-glove with fascism, this nationalism does not in any way make America, fascist, being as it is solidly democratic with a culture of dissent and free-speech, which at the very least is light years beyond what we have in supposedly non-fascist India. Modi gets this. He calls the PM for a US Presidential style debate. He keeps the nationalistic rhetoric knob turned to eleven. He tries to make the connect. Which brings us to America’s majorityarianism. It is unquestioned within Americam, at least the religious part of it. While the country has recently, and that too with much hesitation and much resentment, has had a Black President (which is a huge step forward in racial minorityarism, even though Obama with his Causasian features and accent-corrected English is not really “black” in the way Jesse Jackson is or Martin Luther King was, and this may be said to be a convenient panacea for “White guilt”), there is no way in Hell that religious majoritarianism in US is going away any time soon. Simply put, anyone who is not a Christian will never become an US president, at least not for decades, if not centuries. Forget a Muslim or a Hindu, even for Jews, who are financially and politically powerful, but behind the scenes only, being the most powerful citizen of the country is something that they can never aspire to. The biggest stars of Hollywood, the bastion of American liberalism, will never be non-Christian. Hindus like Jindal or Sikhs like Haley can only have a political career, post-conversion. And no one, not even in the most liberal of spheres, makes that much of a hue and cry over this. It is accepted as a fact of life. (As an aside, Obama, has to repeatedly say “I am not a secret Muslim”, not “So what if I was a Muslim?” Also Obama would never say, without committing political suicide “African Americans should have first priority on national resources” , forget “Muslims should have first priority on national resources” ). But even with this majoritarianism, minorities, from all corners of the world, flock to the US, even though it is perhaps not the behemoth it once does, because it provides physical security, more chances to make money than any other place and freedom. Which Modi would also say is the solution. Development. Money. Government getting out of the way. No going out of the way for religious minorities. The American model. Maybe not majoritarian in the way America is, for only those but the severely indoctrinated would understand it is not an ideal practicable or desirable in India, but definitely not a country where if you do not think that minorities have a veto, you are vilified and branded as communal. And this is where the skull-cap incident is so significant, Modi is taking a hard stance against minority appeasement. his is not just a matter of principle but a canny political move. He cannot play the game following the rules defined by Congress and other regional parties. He has to distinguish himself from it. He thus offers up an alternative, a post-communal ideal (which does not mean he is above showing off his Muslim followers, after all elections are still to be won), based on a concept of universal development (not that it is particularly well-fledged out but then all politicians are notoriously miserly on specific details) and not on religion/caste-driven targeted intervention (like Mamata Banerjee’s stipends to Imams, that the High Court struck down subsequently) or a perpetuation of a narrative of victimhood ( Your qaum is under siege. We only care for you. Vote for us. The others will kill you. The others are falsely implicating you as terrorists. None of them are terrorists, at all, regardless of what the courts and the police say.”). Of course, it would be naive to think that all of Modi’s supporters care for a post-communal ideal or care for the nuances for a more fair definition of secularism. Many want, in essence, the Saudi way of governance, where minorities are reduced to second-class “dhimmis”, a bizarre kind of deification of the Islamic notion of nation while ostensibly being firmly opposed to it on principle (“I hate you that I love you” type). But as I had argued, in a previous post in this series, this group is not significant enough electorally (though they do make a lot of noise), for if they were the Singhals and the Togadias would have been political forces. But coming back to the whole “American ideal” thing. While India can justifiably claim to be more pluralistic country than America in one sense, where an Italian Christian can be the nation’s most powerful person, and the religion of film-stars does not get in the way of their worship, isolated examples of the Khans and the Sonia Gandhis do not hide the fact that there are undeniable cases of systemic bias against minorities, and among them Muslims most definitely, in terms of housing and employment and police harassment. Here is the thing though. The way India rolls, there is discrimination against everyone. It’s bizarre almost, this equality through discrimination. Non-vegetarians are denied housing. So are single people. Bihari folks are targeted for violence in Mumbai. I know of a Bengali software engineer who was slapped in Karnataka by an auto-driver for not being able to speak in Kannada. A Muslim landlord puts religious inscriptions on every wall, which his Hindu tenants have to live with. And the most persecuted minority in India is women, who live in fear across villages and cities, of being raped, lynched, murdered and have their freedoms grossly limited. Of these, the religious schism is the one that is most exercised, one that is cherrypicked and hammered hard, that too purely for votebank reasons, and it is that which makes many urban Hindus most uncomfortable because they feel vilified by it, all the time. This has an appeal. This has a logic. This, also given India’s polity, has the ability to polarize. But then of course, the biggest thing working for Modi is the other side. His poll-agents. The Congress. We shall come to them. Pseudo-secularism in India has become a institution in itself, which has become a addiction to “secular” political parties. And like any addiction, it is getting progressively worse every election cycle, as the “secular” political parties climb over one another to prove their credentials in appeasement. After 60 years of self-rule, we ought to have been the second generation of a free billion, expanding our role as a civilizational entity that shaped the geopolitics of the world from Southern Russia to Bali for 3000+ years. Instead we are a soft state, an exploding pressure cooker, struggling to extricate itself from perpetual poverty, and geopolitical insignificance. It will take 20 years of governance under Modi to even bring this to a “normal”. Your statement is under assumption that Modi has the ability and power to bring everything to normal. Most dreamy-eyed Indians stare at Modi expecting that he has a solution to every problem that ails India (“sab marz ki dawa”) and as soon he ascends to the throne, all these ailments will be a thing of past. The expectations of most Indians from Modi are so high (and I don’t blame them) that one misstep by his government, and expectations might come crashing down. Reality might be also be something else. What are the chances that BJP gets an absolute majority – if not, it will have to make political ties which might involve compromise with its agenda/principles. Pseudo-secularism has helped most political parties gain vote. What are the chances BJP won’t resort to same gimmick to get re-elected in 2019? Agree with you. This is so similar to what happened with Obama. The expectations when he took office were sky high. And, what Obama said in his election speeches and what he did/delivered are two very different things. Also, not very sure if he will work on the lines me says in his speeches. Great if he is able to. Under Congress derivative or Modi, the concept of India likely does not have 20 years left. This is a superb article without any doubts. However, I feel american experience with religion would not be what it is had it undergone the misery of religion based violence over a millennia followed by an outright partition of the country accompanied by more violence. Thus it is not surprising that India and US show little parallel in this regards and would be unfair to ask for such. However, US does have schizophrenic relation with another behemoth of an ideology abiding by which it faced a nearly violent end – capitalism via great depression and vs. communism in cold war. In fact very few countries have a political class which is so ridiculous as US when it comes to capitalism (and hence socialism). By indian standards US is far more socialist (medicaid, social security, powerful unions opposing immigration etc.) but any perceived mention of socialism makes even the independents squirm. At the same time the mecca of capitalism – wall street, never seems to find any positive mentions in pop-culture. I believe the greatest contribution of Modi would be to at least change the way we look at secularism. And I absolutely second you when you say the current form of secularism always feels like a deliberate poke in the eye of the urban hindu. May be this hurt and disgust is the glue that binds the most fanatic volunteers of Modi. Amazing how IH’s fall for empty rhetoric and miss any actuall data. Here’s a blow by blow account of just who is getting appeased in India (Hint: It’s the richest, most powerful community in the land. Not one that experiences a genocide every few years). Unlike you quotes numbers and not words. A government failing to act effectively on its rhetoric (not unusual) does not deny its intentions. Also would you care to quantify ‘genocide every few years’ in both space and time? I don’t know the present status , but when I was young all large religious melas were subject to tax [ called mela entry tax] collected by authorities. Further , all train tickets booked from the that particular-station use to carry “mela surcharge” . Never been to any recent Kumbh Mela so can’t say whether mela tax still being collected or not but during Kumbh Mela of 1978 or so , mela tax on entry of vehicles and mela surcharge [ of Rs 2/- in 1978 or 79] on every railway ticket booked was very much there. As per the archives published by some mewspapaers, during British Rule [ Don’t know the status under Congres Rule],organising committee of Kumbh Mela used to earn profit in lakhs. So I doubt whether “subsidy” is the right word to be used. Any way , it needs further study whether government is susidising kumbh mela or investing in an religious opportunity to earn profit. [ Hint: if those numbers were valid it could have been put up before court . The reason it being not put before correct authority is that these numbers cannot stand scrutiny]. Further , as read in newspaper , the expected revenue earning by UP government during kumbh mela was 12000 crores against an investment of 3000 crores. Not a bad investment idea. Hopefully use of word “subsidy” for an investment will make complete discussion upside down. Start family planning and science education. Stop treating the remaining parts of Hindu majority regions of the subcontinent as Kafirs worthy of Da’awa. For starters this would help the Islamic community find a semblance of “progress” as the rest of humanity understands it. If this advice is not secular enough, then there is always the “pure land” of Pakistan where the Muslims can promptly depart for. “Hindu nationalist” doesn’t mean “Hindu” + “nationalist”, as Modi says. The word Hindu there is a modifier of nationalist, not simply a word tagged on. A Hindu nationalist is someone who believes in the ideology of Hindu Nationalism or Hindutva or “Hindu Rashtravada”. That is, they believe Hindus form a nation whereas Indian nationalists believe all Indians put together make up a nation. To understand this, we need to understand that in its original sense, the word nation didn’t refer to a geographical territory or a sovereign state as we have come to understand in the modern time. Nation originally meant “a community of people who share a common language, culture, ethnicity, descent, or history”. So any group of people could claim to form a nation based on this definition as long as they could prove that they had a distinct culture/history/ethnicity etc. This is the argument Jinnah used to claim that Muslims and Hindus of India are two separate nations. The Hindutva argument is also similar, except they co-opt the non-Hindus also into this “Hindu Rashtra” by arguing that non-Hindus of India were also originally Hindus and they converted to Islam/Christianity only “recently”. Then it becomes easy for them to argue that India is essentially a Hindu nation and its culture should be based on Hindu culture, non-Hindus should also respect/adopt this culture, etc. Whereas, an Indian nationalist goes the other way. He argues that all Indians of all religions together form a nation. The basic nature of this nationality is neither Hindu nor Islamic or nor Christian, but it is just Indian. So the very definition of this nation is different from the way a Hindu nationalist defines his nation. So you can’t take Maulana’s statement (where he is asserting that he is both a Muslim and an *Indian* nationalist) and equate it with Modi’s statement where he is admitting that he is a Hindu nationalist. They don’t say “more or less the same thing”. Not even close. Actually no. Read Modi’s statement though I doubt reading it would make any difference for you. He says I am born a Hindu and hence Hindu. I am nationalist because I love my country. He actually makes it very clear that he doesnt mean “Hindu nation” but considers them separate entities. Of course Maulana and Modi dont say anything close. For the jaundiced eye, even plain English isn’t close enough. Then he is either ignorant of what Hindu Nationalism means (unlikely, given his RSS background) or is just indulging in some clever wordplay to avoid answering the question. To repeat, the phrase Hindu Nationalist doesn’t mean a Hindu who believes in Indian Nationalism. Gandhi wasn’t a Hindu Nationalist. Excellent piece Arnab and I agree with a lot of it. Mohan does raise a valid point though. The term Hindu Nationalist is not generally understood as born Hindu + Indian nationalist. It has a more loaded meaning than that and I am sure Modi is aware of it and that’s why he felt the need to twist it a little. All politicains try to twist words to suit their agenda and Modi is not above it. I am wondering though why such a snarky treatment to Mohan’s valid comments. You didn’t need to add the statement “I doubt reading it….” when just an exhortion to read Modi’s statement would suffice. You have a viewpoint and so does Mohan. Such a combative response makes other people wary of commenting here. Just saying. Let’s try another exercise. Replace Hindu with Tamil as in Tamil Nationalist. Yet another, Brahmin. Yet another – Rich, The best defense against Modi is, as they say in America – he misspoke 😛 .Otherwise this is another dog whistle – he meant what he spoke !!! I am amused at your (predictable) sterile talk of puritanical ‘indian nationalism’. First get used to the fact that there is no such thing as pristine ‘Indian nationalism’ devoid of hinduism. ‘Indian secularism’ is deeply hindu in character. Hinduism deeply and completely binds the nation. Even indian democracy springs from hinduism (and indirectly from buddhism which unlike islam which drove out everything else was allowed to flourish with relatively little violence). Heck even geographically india is what it is today because of hinduism (Please read K.P. Menon and you will realize the background role hinduism played in getting this very nation together. I don’t seem to recollect but there seems to be one particular state which is still a problem and what is it’s majority religion. But that is for next time.) So hinduism is the the template of our secularism. Nothing wrong is giving it an important place in discourse. Arnab already clarified how deeply un-hindu the idea of ‘dhimmi’ etc. are to hindu. vasudev kutumbkam is what we believe in. minorities are quite safe under hindu rule. so it seems like he is not prepared to loose even a small part of it. I wonder what he would think of blasphemy, apostasy, freedom of expression, jihad etc. in the context of a modern nation state. Seems like just a matter of time (he died early) before this would also morph into a highly exclusive philosophy like almost everywhere else where islam is ruling. I’m not so sure about attributing democracy in India to Hinduism. On a global level, during the same time period in which India gained independence, many new democracies emerged from former colonies. My own personal theory is that democracy was adopted because it was seen as a highly desirable and ‘modern’ political system to emulate, not just by the Indian leaders of that era, but also other nationalists in other countries. The most relevant example I can think of is Turkey- which was pushed into being a democracy by Kemal. According to me ,the modern Indian state and it’s ideals took more inspiration from ‘western’ sources(socialism, secularism, et al) than from any ostensibly Hindu source/ political thought. If there was any role that Hinduism played, it was probably at a very subliminal level-and that will remain hard to prove. Dear Bhola, point is not about whether Hindu Nationalism is better or worse than Indian nationalism. Point is, historically those terms have been used to refer to two contrasting ideologies and I am sure Modi is well aware of it. So the question is, rather than answering the question of whether he believes in Hindu Nationalism or not, why did he feel the need to twist the phrase to give it a new meaning (“I am a Hindu and I am a patriot and hence Hindu Nationalist”) which is not how that term is generally understood? 1st understand the what secular means in western context and why there was need in the first place.. their secularism in in negative sense because of clashes between claims of superiority of religions, they need tolerance because they think other religion is just crap but i am tolerating it but in india we have mutual respect for all religions. “Sarvadharmasapekshata ” ” truth is one, sages call it by different names” is our traditional value if you know anything about out traditions.. So western parameters can not be blindly applied to compare our religion .. they can not completely define our traditional wisdom. But obviously our maa baap gora sarkar attitude will not change that easily. Superb bit, Arnab. I think you hit upon a very deep reason for Modi’s popularity. @Karaya , I read that article you pointed to. The writer brings up the point of the kumbh mela expenses. He forgot a tiny point. Hundi collections from Hindu temples go to politically controlled trusts, aka, government. Control for that and you’ll realise that nowhere are hindus being subsidised. kya baat hai. i am very much in tune with everything you are saying here. enjoying these posts very much. keep them coming GB and don’t lose enthu. Wondering, will you also talk about Togadia/VHP/ShivSena almost disappearing from Gujarat ? I wish you could speak all these in any TV debate. You could have a mass following there too (TV). Nevertheless, this is an outstanding series. Pity that only internet users are aware of this. Please get it published in some major daily. If I had the resource or connection I would have arranged for a TV debate. If you can please, please use that medium too. Again.. Very well articulated. I was not at all aware of the negative connotation of nationalism. The more i hear politicians criticize and abuse Modi, my support for him grows stronger. I’d even go to the length of attending his rallies and campaign for him. Great insight on Modi’s statements and USA over all, already read the article 3-4 times, however I fear you are overreading Modi’s statement, I doubt, he meant this so much depth. I am not able to decide whether he should have attended the Patna rally after security briefing, was he risking life of his supporters or honoring the commitment and standing to terror more important, what do you say ? I think what he did was right. He made a stand, and adults attending the rally always have the personal choice of considering their own safety and leaving. Absolutely fantastic analysis. one of the best of late. Will wait for Part 4. Eagerly waiting for your 4th part on the Congress since that is why I support Modi. I was one of those who enthusiastically cheered when Manmohan Singh won his first & second term. However, this cheer turned to despair and eventually disgust when I saw the naked manner in which corruption, populism and nepotism held sway in the UPA with all pretence of governance being discarded. To be fair, the Congress was always corrupt, but never in this blatant a manner. Never was money so blatantly stolen as by Vadra and Co. Never were whistle-blowers victimised so viciously as Khemka. I am no fan of Modi, but I want him in power so that the Congress learns that it cannot get away with everything it has done over the past 10 years. Of course every other major muslim-majority country not only has Islam as it’s state religion, but they organise themselves together into an Organisation of Islamic Cooperation (OIC) which is officially recognised by the UN. Sure, they don’t have to be apologetic about it. But what about the ‘enlightened’ West whose approval we constantly seek? The EU’s most powerful nation state, Germany, is led by the “Christian Democratic Union” party. They don’t have to be apologetic about using the word Christian. What about the Scandinavian countries who’s Nobel prize is the ultimate stamp of approval? All have Protestant Christianity as their state religion. They don’t have to be apologetic. And what about the mother country of all our leftist Guardian-reading intelligentsia, England? Again Anglican Christianity is the state religion. Nothing for them to be apologetic there. Yet when it comes to us, forget about official recognition of Hinduism or a “Hindu Democratic Union” party (blasphemy! ), the mere mention of ‘Hindu’ and ‘nationalist’ in the same sentence will make you subject to endless scrutiny, and eventual vilification. This is the lot of our mentally enslaved nation. I just used the word nation. Over to you, o wise Indian, to split hairs over it. Good to see some thoughtful comment. Where do you live? Would you be interested in using your understanding for some more thougtful work. This is the result of the Sangh Parivar’s ways. You could call me a Hindu nationalist too but I am not afraid to call the RSS brand of nationalism a clone of Fascism/Nazism. Please read ‘The Argumentative Indian’ by Amartya Sen to understand the indic democratic traditions. Also if western thought from colonialism was all it took to become democratic how come Pakistan did not become one? How come none of Arab states became one? How come Russia and Germany deeply seated inside western world did not become one till forced down the throat? A balanced and well-articulated post. You have pretty much nailed the key aspects of Modi’s ideological positioning (I use the word positioning because again, perception is more important than reality) and reasons for mainstream media’s hostility to him. 1) Undoubtedly, the US model is appealing to a large section of our class but I am sure you will agree that what worked in the US will never work in India. Reasons are manifold – most of them are cliches but race also has got a lot to do with it. But that is a story for another day. Unlike the “American Way of Life”, there is no “Indian Way of Life”. But middle class doesn’t have time for such nitty-gritties. While I definitely don’t condone the symbolisms which our politicians induldge to appear inclusive, you can’t deny that you need someone who is less divisive and less polarising to run this country. Someone who invokes reactions of extreme admiration or hatred can hardly be that person. 2) You bring in the factor of Nationalism while quoting Modi and Maulana and eventually build on the comparison with the US model. But, given the fact that tomes have been written on “The Idea of India” and “Who is an Indian”, isn’t the whole concept of nationalism nebulous when applied to India? That would put the whole theory on a less than firm ground. I believe the same applies for Nationalism defined solely on Hindu-ism. Probably, one reason by RSS and BJP could never make inroads in the South India (except Karnataka). You do a “replace-all” of ‘Muslim’ with ‘Hindu’ in Maulana’s speech. But is it so simple to talk – in the same vein – about a revealed religion with precisely defined dos and donts and a way of life and a belief system (I purposely don’t use the term ‘religion’ here) which doesn’t have any uniformity in practices, God or scriptures, which took whatever came its way and evolved. But I digress because this is not the subject of the post. 3) For all the claims of Modi’s “Justice for all, Appeasement to none”, one just has to travel through Gujarat to understand the systemic discrimination Muslims face. And I am not talking about the level at which the society operates like renting out a house but the spheres where the state operates like getting a swerage connection, getting bank loans. A recent article in The Hindu (you can wave this off as selective left wing reporting) talks about 2 illegal colonies of Ahmedabad (more or less similar in class composition) – one Muslim and one Hindu. The Hindu one has been ‘regularised’ and got power, water and sewarage connections. I leave it to you to guess the condition of the Muslim one. That’s how Modi’s “Justice for all, Appeasement to none” has played out in his home state. But never mind. The urban, Hindu (I haven’t yet come across an urban, upper middle class Muslim or for that matter Christian – even the most strident anti-Congressis – who supports Modi), Upper Middle class doesn’t need to bother about such things. And as you rightly said, what Congress has done in the past and is doing now, is just making Modi’s job easy. I also think that the ghost of 2002 will continue to cast its shadow on Modi in a way 1984 never did for Rajiv Gandhi. Modi knows this too well. Hence, all this window dressing. As an after thought, aren’t some of the biggest names of Hollywood Jews? Your take seems more balanced by the way. You also pointed out Modi’s failures. Hard to find such views nowadays. Commendable response! Like a 350 run chase going to the end overs, the Modi victory is seeming to be more possible by the day. As a consequence, you will be coming across more such articles as well as hitherto closeted fans crawling out of the woodwork. Just to add to the last part you mentioned about 2002/1984. Though both events were equated whenever the question of guilt arises, what is misses is that the Congress has mended itself and made some sort of peace with the Sikh community. It is after all a major political entity in Punjab today and giving a good fight to the Akalis without getting too overworked and defensive about the past. Like the author, I am also an ‘urban upper class Hindu current NRI’ who though had the misfortune of witnessing 2002 at close quarters. In fact, I wouldnt be writing this post today if I were not selectively spared by some large hearted Hindu Nationalists brandishing machetes because I was a Hindu. You are partially right about Congress making amends with Sikhs but it is political exigency at best. Moreover, Modi has managed to be brazen and succeeded (at least in Gujarat) primarily because of demographics – Muslims constitute around 9% of Gujarat’s population which he can afford to ignore and bulldoze his way to 3 consecutive election victories. Of course, it also says a lot about Gujarat’s Hindu majority – certain traits of theirs which has got nothing to do with Modi. But that is a story for another day. While Congress atleast sacked Tytler when the case against him re-opened, Modi appointed someone who was eventually convicted in a court of law as his Cabinet Minister (Maya Kodani). So, I guess Congress – not that sacking Tytler makes them angels – is at least bettter at managing perceptions. Modi was no more than a provinicial leader till a few years back – in a province where he could afford not to care about perceptions and persona. Now, that he is playing the game at pan-India level, I am sure his budget in PR and image management would have gone up manifold as he has to take perception management seriously now. Even I had the misfortune of witnessing those dark days of 2002 from very close quarters – being at the wrong place, at the wrong time more than once. Our 20-year old minds were agile enough to give a Muslim friend a Hindu-sounding name when a crowd barged into our hostel room. But most of us had taken quite sometime to come to terms with the insanity and mindless brutality we saw and experienced during those weeks. So, when I see these Modi-fan boys trolling around in the online world – pulling out SIT reports and sharing links from Niti Central – I just wonder if their idea of a communal riot and police inaction is restricted to Mani Ratnam and RGV’s movies or are they really pea-brained? Since I was one of those who cited the SIT report in the comments section, this one deserves a response. The very fact that you refer to a Supreme Court monitored investigation so disparagingly, shows you up for someone who has no place for the law, only for your own subjective biases. It would be one thing for you to question the opinions of the SIT. But to question the basic facts which have been rigorously investigated is nothing but the denial of truth. I cited SIT in the context of the lie that Modi waited “3 days” to call the army, a canard (among many) started by many busybodies. I challenge you to prove otherwise, or else retract your statement that I was “trolling around”. Someone emailed through this article, and though I know better than to indulge in debates / arguments / opinions in the comments section of a blog post, there isn’t much else to do at work. I have often wondered about the Indian (largely Hindu) middle class’s obsession with Modi. All the hype around him, he will fix everything, look at Gujarat, etc. The fact is that for the 70% or so of the population that lives in poverty, it does not matter whether it is Modi or Manmohan – life for them will remain the same, a grind where their best bet is to earn enough to survive. In their economic outlooks, not much separates Modi from Manmohan, and so not much will change on the ground. So leave aside that 70 or so odd percent, and let’s look at the likes of the blog’s author, and their unqualified admiration for all things Modi. Let’s deconstruct this blog: one line on the communal riots in Gujarat, followed by paragraph upon paragraph on pseudo-secularism, nationalism and so forth. What does that show? That there is one point that even your urban middle class Modi fan will not defend in public, not if they also want to be thought of as liberal, modern and progressive. So you brush that aside, sweep it under the carpet, and instead focus your attack elsewhere. That is basically what this blog post is. But hang on a second, why brush past the massacre of 2000 innocent people, citizens of your country, of your state. This is not about what Congress conveniently defines as secularism or the empty, symbolic gestures that they make – we all know that riots have happened on Congress’s watch, that they are just as culpable. But does that excuse Modi? No. Here is a man, under whose watch, 2000 innocent people were massacred in the most brutal manner, while he, at best, watched. Ignoring for a second his involvement in it, whether he gave the order or not, the fact is that it happened while he was the Chief Minister. It happened on his watch. He did nothing to stop it. He refused to deploy the Army. He allowed 3 days to pass. I ask the simple question – how can any reasonable person support this man for the job of Prime Minister of the country? Since you bring up the example of the USA, find me an American president who sat idly by as 2000 Americans were butchered and did nothing. Find me an American leader who did that and then ran for president, supported by the people of the country. I don’t care whether Modi wears a shawl, a skull cap or a tilak or whatever. It is immaterial. The massacre of 2000 people cannot be brushed under the carpet. I usually find that there are two kinds of Modi fans, both obviously from the urban middle class. The first type is that which yearns for a return to the “glory” days of ancient (Hindu) India, when the country was at the top of the pecking order. Now its conveniently forgotten that the ancient days weren’t so glorious either (think sati, think manu smriti), that there were other civilisations (China – anyone?) who weren’t doing too bad either. No, this type believes, that this was the golden age, when India led the world. They grow misty talking about that time, thinking back to how wealthy India was (never mind that the poor lived much the same as they do now). In their minds, Modi will take India there. If you read through earlier comments, you will find one such fan talking about the 3000 year old civilisation. If one stops to think, is this type all that different from those wanting a return to the golden age of Islam? The other type is more dangerous because they profess liberal, progressive values. Although how do liberal, progressive values hold up against the communal massacre of 2000 innocent people – I don’t know. And yes, I will keep mentioning the massacre because I do not think it is something to sweep under the carpet. This type thinks that Gujarat is actually shining (remember shining India from an earlier BJP slogan and how that turned out). This type does not read reports on human development indicators in Gujarat. This type is also enamoured by the USA – it wants governments out of the way, capitalism in, and lots of companies making lots of malls where lots of their middle class brethren can walk through, dreamily staring at the glass displays. Never mind that the US is today heavily mortgaged to…wait for it…drumroll…China. Never mind that in the US, a small minority owns and controls all the wealth, that inequality is rife. Never mind that the earth simply does not have enough resources to support all of us living at a typical US middle class level of life. This delusional type wants Modi in, so he can go about creating McIndia on a much larger scale than Gujarat. And what happens to the remaining 70 or so odd percent – well, nothing, if they manage to survive. One last point on the Nehruvian age – it was the schools, colleges and IITs setup during the socialist years that created the urban middle class. If you had market reforms post-independence, as some argue now, whining about the “lost years” – what industry would we have today? What service sector would we have today? None. A newly independent country with little technical or industrial skill and rich resources would have been pillaged by Western corporations. Look at the Latin American countries who suffered much the same fate. I know expecting you to read the SIT report will be a tall order, at least check a calendar of 2002 and count how many days are there between Feb 28 and Mar 1. And before you brush aside this point about “three days” as a minor one, please be aware that it makes all the difference to your central assertion that Modi “at best watched” and that he actually did things to curb the riots. And by the way, the worst riots in the US in recent history took place in LA 1992, the governor of CA was one Pete Wilson. Nobody ever hounded him for being personally culpable for the riots despite a vigilant media. He later went on to run for US Presidency in 1996. I would rather read the NHRC report. Why don’t you read it as well? That report does mention state complicity. Or perhaps I will read the one by Human Rights Watch. They usually do a thorough job. Or would you rather have me read the Nanavati commission’s report? I have answered the 1 March claim below. Flag marches don’t do much to save people’s lives. Next time your house is on fire, make sure there is a flag march in the street outside. It will put out the fire. As to vigilant US media, is this the same vigilant media that argued Saddam had WMDs? Built the case, convinced the public and took a country to war. Vigilant is the last word I would associate with the US media – the jokers on Times Now do a better job! I am glad that he didn’t become president. Let us hope that neither does Modi. ‘He refused to deploy the Army. He allowed 3 days to pass’ When it was comprehensively proven that you spread a falsehood, then you say ‘Flag marches don’t do much to save people’s lives’. What’s wrong with flag marches, have they not been done in Muzaffarnagar, Assam? Will you make the charge that Gogoi and Yadav are mass-murderers? Typical of your type, you shift the goalposts when they suit you. Next you will complain as to why Modi didn’t call the Air Force to bomb Hindu localities. You will cherry pick the reports you want to believe in (which actually doesn’t even indict Modi personally), but the one investigation that actually went into the question of the CM’s culpability (unprecedented in India’s history as the same was not done in Rajiv Gandhi’s case or any other political head’s case), monitored by the highest court of the land, you will discard with contempt. Bottomline is you will clutch on to your narrative no matter what. It is this mindset of Modi detractors which attracts him followers in droves. First half of your rant (>2000 people killed, modi did not do anything, he took ‘3 days’ to deploy the army) are simply canards which have been refuted before. Please learn to google. I will help you with one of them – train burning 27th Feb 2002, Army called on 1st March, 2002 – that is a gap of one day during which he frantically asked neighboring states for police forces(request denied). Secondly, India did have a glorious past. Get used to taking pride in it. And it is mentioned not by us (whose version you would dismiss as jingoistic) but by assorted travelers from other civilizations – from the chinese, persian, arabic and european. Of course with general march of progress many things look terrible in hindsight. But please google/read about antics of other contemporary civilizations. I will help you with one of them – romans took slaves and then made them fight each other to death in public spectacles. They also managed to crucify the only son of God. And yet every great country wants to be the roman empire. You seem to think capitalism is doing very badly for the US. So badly that they still want to stick with it. In fact everyone wants to stick with it. Even China wants to stick with it. It is in so much debt that last time I checked, US credit rating is still AAA, its average standard of living among the highest in the world, it still has a vast majority of worlds top institutions and it continues to lead the world in innovation through VC based startups. Which other country do you have in mind which Indian middle class would want to emulate? I don’t really know if I shall do you a favor by knocking down the nehruvian stuff or let others do the favor. I will just mention one.Our country had half of its population illiterate at the turn of the millennia, 50 years after independence. Of course nehru’s ideas and its amplification by his offspring played no role in it. Anyway, if you have any more doubts, self flagellating impulses or pangs of nihilism do visit google. Seems like you have a lot to learn. But it is never too late. 1. I did Google. A few flag marches do not qualify as large-scale army deployment. And in any case, why wait a day? As to numbers, does it make a difference whether it was 2000 or 1200 or 1000 or 800 or whatever? Does 2000 mean Modi should not be PM but 800 is acceptable? 2. Oh I do take pride. And is not about that. I wonder why people go all the way back to ancient India. The fact is up until the 1700s India and China accounted for the largest portion of global production. So why not look a few hundred years back and call that the golden age? Is it because the rules were Muslim? So go back to a time when there were no Muslim rulers? By the way ancient India, if you can call it that considering that even at the height of the Mauryan empire, it didn’t cover the current national boundaries, also had its share of barbarism. There were slaves. Enemies were trampled under elephant feet and then there was Manu and his laws. How far did that set us back?! 3. Are you one of those people who believes that all that matters is your AAA rating? A rating determined by a bunch of private institutions. That GDP is all you need to determine economic progress. Do you know the history of how the US became capitlaist? I did the search for you. Btw recently, an economist spoke at Cambridge, you can search the article on the Guardian, and the said economist (a capitalist by the way) wondered how it is that despite the whole financial crash, no one seems to talk about alternative economic models? You have banks nationalised and bailed out but not a peep about changing the way the system works. Why? You will find some answers in that link above. Answers with numbers – they usually appeal. 4. As to Nehruvian models, so we had half our population illiterate 50 years after independence. In more than 20 years since market reforms, how many of our population live in poverty? And let us not go by the revised poverty estimation figures that Montek Ahluwalia dreams up. We have a proliferation of schools, but how many of us can afford those private schools? What is the standard of Kendriya Vidyalaya today? Would you send your child there. Sure there are some good ones but I remember when I was young and most of us studied in a KV and how it was still good. I am not talking about big cities. I am talking about small town India. I can go on and on and on. That isn’t to make the Nehruvian socialist model some amazing thing we had. It had its downsides, many of them. Just like the model today has its downsides, many of them. Perhaps you should be the one on Google. It will clear up some of your delusions. And read beyond the stuff in the mainstream media – Rediff, NDTV, ToI, Indian Express and the like. Also do look up Gujarat’s human development indicators – you will find some interesting figures there too. I am very glad that you finally resorted to googling before wallowing in self pity. However, your arrogance, very typical of a liberal caught red handed regurgitating second hand lies is rather disappointing and leaves much to be desired. If numbers are inconsequential then why trot out the higher values? Why not say openly that you have a problem with any candidate whose policies have even indirectly resulted in a single death? I have a feeling that it would leave you with only quixotic people who never exercised any real power. This may well explain your nihilist impulses. I never stopped you from taking pride in muslim kings. Please re-read my comment. Clearly your interpretation shows your communal mindset. Rest of your second point is irrelevant. I already said many ancient things would look barbaric from modern perspective. As far as your ‘why no one is thinking about ending capitalism in spite of dozens of financial crisis’, the answer is the same as to why no one revisits the theory of gravitation after hundreds of plane crashes. There is a very broad consensus that economic reforms have ambiguously benefitted India (force fed to PVNR after catastrophic failure of Nehruvian voodoo economics). To not get this simple fact, either you are not paying attention or you were born in early 90s which could explain your rather bieberish rants. I am replying to your follow up comment Bhola. that one does not have a reply option. The argument is going off topic anyway so I’m going to stop here. 1. Official figures 1044 dead, 223 missing. Now you may presume the missing as dead or otherwise. A study by John Campbell said 2000 or so were killed. I am sure there are other studies with other figures. So no I haven’t been giving out lies or otherwise. I simply have a healthy distrust of “official” figures. You may not. That is our difference. And yes, I do not believe anyone whose policies have caused innocents to die, even one person, should be elected to high office. I don’t think that leaves us only with quixotic choices. I do not believe power or real power or however you define power can only be exercised through violence. In fact, I believe that as long as we excuse violence, we will continue to have shoddy politicians. The SC judgement allows you now to not cast a vote for any candidate. If the people take a stand, refuse any politician guilty of unjustified violence, directly or indirectly, then one can hope for change. You may call that being naive. I’d call it ideals. 2. The ancient India remark was directed at a certain niche of people, for whom that period was the only glorious time in Indian history and who yearn to return to that time. Read my original line. I simply questioned that thinking. 3. As to plane crashes, does the design of the plane not change after a crash? Or do we fly the same thing as-is? The analogy does not hold up either because it compares gravity, an irrefutable force, with capitalism, a socio-economic model. By your analogy, you are trying to put capitalism within the irrefutable category. I don’t agree. That is our difference. It does not really matter here anyway since Manmohan and Modi are on the same page re economics. As is almost all other political parties, the CPM being no different. Perhaps you would like to back a statement like “broad consensus”. And I suppose you meant to type ‘unabmiguosuly’. I suppose as they say it, the proof is in the pudding. There are numerous studies I can quote including the Planning Commission’s own reports on growing inequality. So yes, the reforms have benefitted, but only a certain class of people. This is the class that finds itself here on this blog, posting comments. This is the class with the Internet connection and equipment to do so. This is the class that flies those gravity defying planes. This is the class tweeting about NaMo. That is not the class to which the majority of Indians belong. I speak for them. The reforms have done nothing for them. If you diagree, take a trip. Can someone .. please please please reply to this? My head hurts with the number of times this crap has been cleared only to reappear again and my patience is at its end. Anyone.. someone.. Please? 3 days for army to be called, did not thing. etc etc. How long will you swallow the kool aid sir? If you want to believe in rumours then head will never stop spinning, new rumours will keep on coming but if you want to give some peace to you then please go through SIT findings..
and 3 days argument is so stupid.. please tell me what comes after 28 February in leap year? 1st march or 29th, 30 and 31st feb? Peeves, didn’t you know that all the deaths in Gujarat occurred due to self immolation and spontaneous combustion? Modi was just helpless. As the Chief Minister of his state, his hands were obviously tied! That just goes to prove how much better he is than Akhilesh Yadav at controlling these volatile situations. No? Hey, but his state does have better roads! Of course he should be the PM! Not sure about other deaths but according to most “liberals” the ones on the train certainly happened that way. Shubs, so may be we make you or Peeves the PM then? What would you have done if you were the Gujarat CM on the 27th of October? How would you have controlled the explosive situation and the wide spread public anger against the Godhra burning more effectively than Modi? ( and a casual look at the religious split of casualties, shows that there was rioting from both communities thus increasing the administration’s difficulties) After that, How would you have kept a state like Gujarat with a long history of communal violence free of major riots for 12 years like Mr. Modi has? While we all are entitled to our opinions, lets give him credit where its due. @ashu: and here is where fanboys resort to the circular argument. First you have NaMo – the greatest tragic hero of modern times, misunderstood, misrepresented, flying around, rescuing stranded pilgrims from disaster zones, being the Hindu-nationalist martyr somewhere else, the biggest target of evil people everywhere, the greatest statesman, administrator, out-of-the-box thinker that modern India has produced. And then when the balloon is pricked, even by a little bit, out come the questions of “but who else?”. Then why don’t you make that argument in the first place? That he is just your no-choice candidate…that he is just another Indian politician – mediocre, borderline megalomaniac with blood on his hands, whose only contribution to the political dialog in India today has been snarky personal attacks on his even dumber political foes. That would put him in the august company of what, 80% of today’s political leaders? But no, you’d kill to prove that he’s Superman. In case you are referring to 15,000 ‘Rambo’ article, that was another concoction by the Times of India for which they issued a retraction. Are you denying he is on the top of terror hit-lists? Were the Patna blasts at his rally just a figment of our imagination? You have got the chronology wrong. Those riots happened when the ‘balloon’ was not even inflated – people knew very little about Modi. Actually it’s the other way round, it’s your tribe which is going all out to prove he is the devil incarnate. ‘Fascist’, ‘Merchant of death’, ‘Mass murderer’ are some of the epithets which Modi detractors have come up with. According to the NHRC (which your fellow travelers swear by), during 2002-2007, there 440 fake encounters in all of India, of which only 4 alleged fake encounters were in Gujarat. Yet those handful cases from Gujarat are investigated by the CBI and endlessly debated on TV, while the 99% of the rest are given a free pass. Ever questioned why this lopsided subversion of the system, just to cynically link one CM with extra-judicial executions? I appreciate the points you made here (though I would like to debate many of them). Do you maintain a blog or some such thing elsewhere? Will love to go through your thoughts on rise of ‘right’ (religious and economic) in India. And this is where the skull-cap incident is so significant, Modi is taking a hard stance against minority appeasement. his is not just a matter of principle but a canny political move. He cannot play the game following the rules defined by Congress and other regional parties. He has to distinguish himself from it…. Arnab… no one could have put it in a better way as you have…Excellent write up!! No matter how hard you try, you failed to hide your biased love for Modi. Nothing wrong with that. But your clinical and very balanced defence of Modi leaves no space for you to dig deeper in his failures. You talk of development agenda but don’t define it. You have written about Nitish and his politics. His attack on Modi in recent times. Why you don’t go beyond that. And why you don’t talk about the numerous bluffs and lies Modi makes in every public speech. His style of spewing venom for everyone not from BJP and selection of crass words worthy of roadside banters is really a shame. I wish you could be more holistic in your analysis in next parts. I am waiting for you employ Goodwin’s law…and start the “maut ka saudagar” rant against Modi. Our history and American history are totally different, so one has to be careful when drawing parallels. One significant issue, pointed out a long time back by the historian Wilfred Cantwell Smith, is that there is no history in our country of the two communities trusting the other. The creation of Pakistan is evidence of that mistrust. Certainly, we have had times in the past when rulers were tolerant but it was always an unequal relationship. Our founding fathers wanted to move away from a society where the minority lives at the mercy of the majority. This, hoTwever, is easier said than done. Trust has to be built between different communities. And this, whether we like it or not, requires the majority community to be sensitive. This is what I feel Modi lacks. I will give Modi the benefit of the doubt and accept that he used “Hindu nationalist” exactly in the sense you say. I will say that I don’t see many Muslims going along with him. Perhaps I am mistaken. an honest process of truth and reconciliation between the two communities is perhaps needed. but this ‘enforced bias’ will never let that happen. it only creates more heartburns and wrecks the credibility of the state as an honest broker. but i agree with your general sentiments. A “minority” that causes a partition is hardly a “minority” . In this globalized world, compared to large multi-national entities like Islam and Christianity, Hindus have to learn to re-think who they think are the real minorities. “….Muslims most definitely, in terms of housing and employment and police harassment. HAHAHAHAHAHA. How can you criticize politicians for dishonesty and say something like that! You brush off discrimination against Muslims by equating it with “discrimination” against Non Vegetarians and Single People? Is that the same entitlement that makes you ask on twitter why it’s not sexist to call a man fat? I used to like your posts, but now I can’t reconcile with your views in any way. You’re a disingenuous combative egotist. “And yes, I do not believe anyone whose policies have caused innocents to die, even one person, should be elected to high office.” . Here in India we honour a person who by their policies and selfish shortsightedness have caused millions to die by title “Father of Nation” and carry his photograhs in currency-notes. This is very nature of we Indians and that is why this new person, allegedly responsible for “chota-mota” killings is gaining admiration across India. Not that it takes anything away from your excellent write-up, but I would like to point out that some of Hollywood’s biggest stars are Jews. That was a great piece of writing. I don’t see the reason that anybody should be shy of calling themselves Hindu Nationalist. I also greatly appreciate his “soochaly before devalay “statement. But how can one forget the venom he used to spew. At the same time I do condemn leaders like Owaisis as well. Let us be proud of who we are now. Democracy has served India well. Let’s count its blessings. Literacy rate is 75% now, no great famines, no cultural revolutions, no many forced sterilizations. New leaders like Kejriwal, Jayaprakash Narayan are coming up. I would throw in my lot with them. There were robber barons in US, oligarchs in Russia, princes in Middle East, sawiris in Egypt. Corruption, discrimination and nationalism are not just the preserve of we Indians, It is a lot more universal. Nationalism has not served any country. Bringing in Modi might be industry friendly, FDI, Land acquisition laws might change. But there would still be some beneficiaries/corruption and not forgetting the fact that we will be living under a leader who had been accused of mass murder. If not for Modi, I was happy with previous NDA rule. After a decade of congress and its corruption, I would be happy with any alternative. But beyond my wildest dreams, we now just seem to be at a cusp of big social revolution . Delhi 2013 elections would be watershed. If we can just get AAP a majority. I wont have to worry about choosing between a rock and a hard place. Will much appreciate if you can write a piece on Delhi 2013. Thank you SO much for this article, dude! I have not read ANY other article which talks about Modi and the current political scenario in such an unbiased and extremely well thought out manner. Excellent read – all 3 parts. Makes so much sense. Really really awaiting your next post of this series. And your thoughts on some of the unanswered stuff you’ve left the readers with. Discrimination cannot be cured by legislation or political intent. Affirmative action like reservation only reinforces discrimination. Which brings us back to the track that India is not a real country. What we have been exposed to since childhood is a whole lot of propaganda- “united we stand, divided we fall” kind of thing. Human beings draw circles of self-interest around them- me against my brother, me and my brother against my cousin- sort of thing. The fact is, being an Indian does not constitute a circle of self-interest. That is why you have Tamils speaking up for citizens of another country- than for the interests of their own country. This strikes at the very heart of nationhood. This “Indian” identity is wholly artificial- a Bengali has more in common with a Bangladeshi than a Kannadiga. A person in Arunachal has more in common with a Tibetan than a Malayali. The only way India can survive this mess is to become a loose autonomous Union of States. Of course there must be many, many more States to truly reflect the diversity. India is India because it constitutes regions that share a common Hindu etho. The parts of the subcontinent, be it Punjab, Sindh, Bengal, that ceased to be Hindu majority, found ways, means and reasons to show a finger to “india”, and form their own dominant ” circle of interest” as your term it. This reality may not go down well with the “secularist”, the real ones and the pseudo-secular ones, but that is the reality out there. Yeah and try going to the non-Hindu majority parts of the country (especially Kashmir) without security, and see if you can come back with your cahones intact. Oh wait! You did not even include Kashmir in your list. Let me try to elaborate my understanding of why the Hindu nation/nationalist term is distasteful to so many Hindus and of course people of other religions in India. First, the Hindu nation that is evoked is like the one of the past and hence to be dominated by the upper caste; thus the BJP’s core base is among the upper castes(Thakur, Vaish and Brahmin castes). They have managed to make a dent among the OBC’s but their stock among the SC’s remains low. Even their support among the ST’s is very less. One of the only Congress strongholds in Gujarat has been the Dangs tribal area, where Modi’s development model has not made much impact; though he might have made inroads in the latest assembly elections. The Sangh Parivar and the BJP/ Jan Sangh had very little credibility at least in the first 4 decades post independence as they had played a very negligible period in the freedom struggle. Also, they were widely perceived to have a hand in Gandhi’s assassination. Gandhi was and is very big in rural India. It was the Ram Janbhoomi movement preceded by the abject failure of Indira and Rajiv Gandhi to provide good governance and their pandering to the fundamentalists in the minority as well as the majority community that gave the Parivar the chance they were looking for. The 2004 elections defeat was a shock to the middle class of this nation; never had all of us misread the prevailing mood so badly. One of the direct causes of the shock defeat were the riots and it is puzzling that no one in the BJP except Atalji has identified it as such and put the blame where it lies, squarely at Modi’s table.It was the mobilization of the Muslim community that was able to propel the SP in UP and the RJD in Bihar, wiping out the BJP and its allies, and causing the defeat. Now coming to why the urban middle class pitches for Modi, again the real answer lies in the class composition; most of them are upper castes. Thus, Modi assures them that by removing the entitlements system as they hope he will, the structural and millenia old inequalities would continue. The SC and the ST, which are the poorest and the most marginalized in India are the most dedicated Congress voters. The party knows this and these are the people who its politics of what you call ‘appeasement’ appeal to, though others might call it social justice! These 2 sections of the society esp the SC’s are the ones which have been oppressed during the times our civilization was in its ‘golden’ period; they obviously do not want us to enter another golden period so they will probably not vote for Modi. All this said and done; I expect Modi to win in 2014 as the polarization that the Sangh has stoked has already started paying dividends in UP and BIhar, after 2014 what will happen is anybody’s guess! You conveniently use passive voice and conveniently bypass the need to specify who is invoking an upper-caste-dominated nation. I am supporting BJP for this election and I do not dream of an upper caste dominated nation. I only hope for a non-islamic nation. You make questionable statements and establish dubious cause-and-effect relationship. How about the possibility of Sangh-sympathizers using the original undivided congress as a common platform for freedom struggle? How about Indian non-muslim population taking 4 decades to confirm the pseudo-muslim-appeasing (actually muslim-harming) policies of ruling dispensation? My guess work is as good as yours. Who gives you the right to tell me what my opinion is? Why do you generalize where it is prone to mistakes? I am an upper caste Hindu and I do not want millenia old inequality to continue. I support BJP for reasons related to Islam. I wish you are correct. However it may not be so. Most of Indian population (and hence the political leaders) are not aware of the threats of Islamic fundamentalism. Hence there will be 500+ elections, each being fought on local issues. It will not be a BJP vs Congress or Modi vs Rahul contest. The combined outcome of those 500+ elections is wide wide open. It will be pathetic if BJP supporters start celebrating right away. The first task will be to ensure our own vote and influencing more and more folks in our circle to vote for BJP. The day pseudo seculars like you stop the divisive politics, dear “pacifist Hindu”, would be the day people in India will breathe a sigh of relief. Never a pseudo-secular , as much a Hindu as any other guy, but our definitions differ. We will work to rectify it. And yes I am a Bajrang Dal/VHP type Hindu, and I am willing to discuss the Upanishadas with you. for some reason half of my comment vanished. We will work to rectify the fact that people like you dear “Hindu Pacifist”, are responsible fro why Kabul still doesnt have the Hindu-multi-culturalism that it had a 1000 years back, and Dhaka still doesnt celebrate Basanta Utsav like it did a 100 years back. Why do you need to worry about Dhaka and Kabul when India itself is slowly losing its multiculturalism. Remember Dr Dabholkar or Karnataka? If radical Islamists decide that they want to continue living in the 8th Century AD, then it is not our problem. The Indian version of Islam has been heavily influenced by the Sufi stream and here still the Wahabbis have not gained control but it seems a losing battle to me. I am pained by what has been done to the Hindu minority by the two nations on our left and right but to reciprocate in the same vein reflects poorly on we as a nation and our ‘Hindu’ culture. Moving tack, does the Hindu ‘multiculturalism’ as you define it give space to the Dalits, the tribals or people from the North East ? I hope that Modi, if he gains power will throw the core RSS ideology into the dustbin and focus on the huge economic and social issues confronting the nation. We need to worry about Afghanistan, Pakistan and Bangladesh. Pakistan, Bangladesh and India form a perfect experiment where you start with 3 samples of identical population imposed with different initial condition . The difference being religion. The result is there for all to see. India is more tolerant today than either Bangladesh or Pakistan. The reason is the tolerant nature of non-Islamic majority. Bangladesh and Pakistan has almost eliminated their minorities. The findings are reinforced by observing the status of muslim majoritiy areas In India. Kashmir (with muslim majority) has eliminated the Pandits. I can give more examples. I see, HinduPacifist, that you are pained by Islam and its dangerous effect. However you do not want to reciprocate in ‘similar vein’. I am assuming by that you are meaning that Hindus should not be ‘eliminating’ minorities in the way Islam does. I agree with that. However, there are other measures. The first step is to admit openly that Islam is a threat to multiculturalism. The second step is to admit that ‘aek brinter duti kushum’ like thought process is foolish. Islam, unless reformed, should not be replicated or sympathized with. Third step is to feel ashamed of the psecular attitude which does not allow these concerns about islam to be voiced. Fourth step is to support BJP purely because Muslims are afraid of this party. I support BJP because this is the only party in India where I can voice my concerns about Islam without getting banished from that party. I do not believe in Modi’s culpability in post-godhra killings. Nor do I believe in Gujarat’s development story. I support BJP only because it is the only party where you can be critical of the drawbacks of Islam. I do not know what Naxals stand for. However, they surely are not rebeling against Hinduism. Your reference to Naxals in this debate completely stumped me. I would like BJP to retain that part of its character which allows its members to be critical of Islam. I would also like to clarify that I as a Hindu will not feel threatened if the country becomes a christian/sikh/jain/buddhist/jewish majority. However, I will be very afraid if Islam reaches even 25% of the population. Also, as a Bengali, I am very ashamed of our psecular attitude. This attitude shows a lack of character (durjon ke kotu kotha bolar shahosh na thaaka). However accepting this racial-weakness will be the first step towards eradicating it. PS: Something tells me that, you hindupacifist, will not be changing your belief on the basis of what you read in a comment of a blogpost. That is not the intention of this comment either. Collection of quotes and videos. Eye Opener !! Fascinating. This post, and most of the comments left thereafter, smack of prejudice. Having travelled, lived and communicated with ordinary folk across the length and breadth of India over the past 34 years, I realise today, more than ever before, how convenient it is for each one of us sitting in our cushy chairs to claim we understand India; when all we’ve had, is a glimpse of it. Am I more qualified than any one of you to pass judgement on who can govern our country better? No. But my experience, devoid of eloquent use of political jargon and the English lexicon, makes me understand the danger we as a country face, if parochialism, chauvinism, xenophobia and ethnocentrism, guised in the garb of pseudo-nationalism, strengthens its roots in our already fragile social fabric. If Narendra Modi is elected Prime Minister of India via a free and fair democratic electoral process, I would certainly welcome the result because I honour the vox populi. Nevertheless, if history has taught us anything, it is that the voice of the people is not necessarily correct every time. Hopefully its choice of propelling the far-right into power to represent its diversity will be the right one. Best of luck to all of us. We’ll need it. Is the pseudo-secularism a term for the left leaning ideology in India? Is Modi the first on the right in India? It seems everyone else would like to paint Modi as the first neo-con of India. More than the NRI Modi Fanboy’s post, I have enjoyed reading informative-fact based comments and how they devolved into usual left/right/center bashing ad hominem personal attacks. Pure virtual ballsy talk glory time. Although it would be highly vicarious of me to leave it at that.I’m a liberal agnostic Indian, not a majority, but I’m sure there is a quite a few of us in this country, if not on this thread. I would love see the corrupt, arrogant and nepotist Congress of today sink like a stone in the next election. However, I’m sure the conservative BJP and its poster boy Modi is not an alternative for me. I’m not looking forward to a time where India becomes a Country where Secularism becomes an archaic concept , because for me Secularism stands for equal rights without regarding the religion of the person. Equal rights to the Poor, Hindu, Muslim, Sikh, Christian, Parsi , Homosexuals, Heterosexuals, Transgenders, Transsexuals and the rest. I’m sure BJP does not believe in such inclusive growth for everyone. So I shall wait, I shall wait for a third option ( I hope AAP emerges as one). Brilliantly put. Finally I see an article which is not politically biased but which gives a clear insight on NaMo’s fame/hatred. I’m still waiting for the 4th part. I hope that’s coming soon. I’ve not read such a well deconstructed and unbiased writeup on Modi anywhere.